Forage — or more specifically fiber — passage rate through the cow has become a “hot” topic among nutritionists and forage researchers in recent years. It’s also a topic that is often misunderstood and, in many respects, counterintuitive. “Thinking about passage rates can hurt the brain,” said Pat Hoffman, retired University of Wisconsin dairy scientist and current nutritional consultant for Vita Plus. Hoffman suggested that our understanding of forage passage rate is improving to the point where we might be able to use this information in the formulation of dairy cow diets. “Undigested neutral detergent fiber, or uNDF, passes faster through the cow’s digestive tract than potentially digestible NDF, or pdNDF,” Hoffman explained in a recent Vita Plus Forage Foundations newsletter. “University of Wisconsin researchers, after reviewing 19 feeding studies, observed an average passage rate for uNDF of 3 percent per hour, while the passage rate of pdNDF was 2.4 percent per hour. Though the differences are subtle, they have important implications,” he added. Legume forages generally have more uNDF and less pdNDF than grasses. 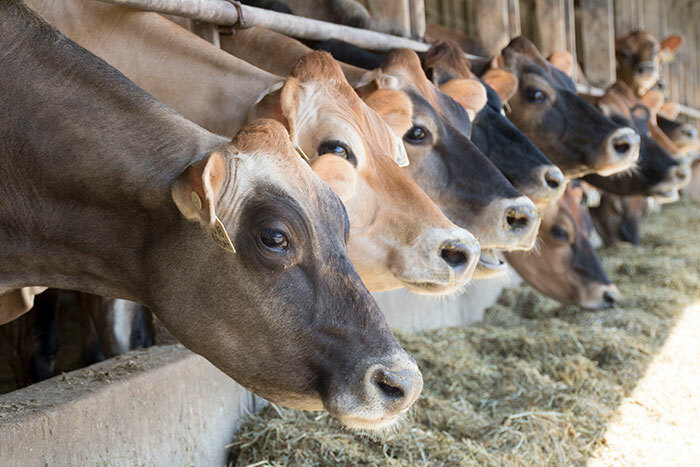 Hoffman said that feeding lactating dairy cows a ration that consists of legumes will generally hasten the passage rate, which usually results in greater dry matter (DM) intake. “The downside of a legume-based diet is that the faster passage rate can lower the potential caloric supply from the fiber,” Hoffman noted. By contrast, grasses contain more pdNDF and less uNDF. Hence, grass forages have a slower passage rate compared to legumes, and because of this gut fill may lower DM intake. Hoffman explained that rumen bacteria can readily colonize pdNDF. These bacteria produce gas to float the less dense pdNDF to the top, forming a rumen mat and a longer retention time. The denser uNDF, which is less colonized by bacteria, sinks in the rumen and exits at a faster rate. Though it is somewhat counterintuitive to think that uNDF moves through faster than pdNDF, Hoffman acknowledged that it is really an ingenious design. “Why would a dairy cow that is dependent on NDF digestion be designed to retain NDF that is totally ingestible?” Hoffman asked rhetorically.